The moon. I took it at 1/400, f/6.3, ISO 800. There was a cool halo but I seem to lost it. Is there any way to bring it out in PP? Otherwise, it looks pretty good! The halo you were seeing with your naked eye was probably caused by ice crystals in the upper atmosphere. Your lens focused beyond the crystals so you don't see them in the shot. It's like shooting through a mesh screen on a window, focus close and you see the mesh, focus at infinity and the mesh disappears. Ahh so to get the halo, I'll need to not focus to infinity, and probably use a very small aperture then, right? has been too cloudy lately to take any sky shots around here. It took a lot of trial and error on my part. To get the shot, I had to switch to M mode and then deliberately underexposed it. I just kept trying until I had something that looked like it might have some detail. Then I processed it in Lightroom. 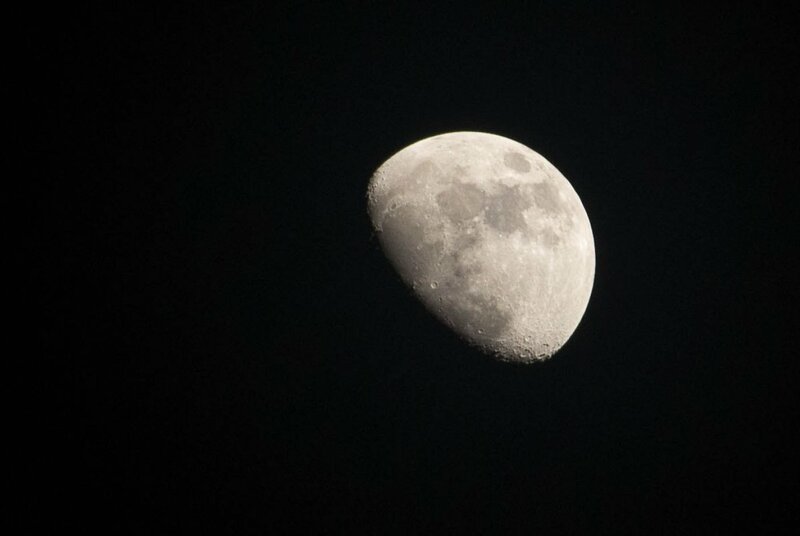 I have done a little playing on moon shoots with a 300mm. I noticed your settings. I have been shooting at ISO 200 F9 or F11 ish and shutter at 160 ish. It is a hard shot hand held but if you have a tripod you are ahead of me. Here is a recent one I took. Last edited by sireddy; 06-20-2014 at 03:40 PM.